Steel is an alloy of iron usually containing less than 1 % carbon. Because of its versatile properties and its recycling possibilities, steel is the basic material for sustained development in modern industrial society. It provides a broad range of uses in almost all important sectors of industry such as apparatus and machinery manufacture, bridge and building construction, power and environmental engineering, and automotive and transportation industries. Steel is and will remain the most important engineering and construction material in the modern era. The steel industry is a very dynamic industrial sector. Further steps are ongoing towards increasing resource and energy efficiency, reducing emissions and providing safe and healthy work environments. For achieving this, the steel industry is to excel in today’s environment which is a highly dynamic and interactive business environment. Market conditions, new product requirements, raw material costs, and process management etc. all affects the performance of the steel industry. The steel industry is an important driving force of the economy and hence it should be run efficiently. Further it needs heavy investments and hence it is essential that it operates economically to keep it healthy. Its products are indispensable for other industries such as automotive and construction. Quality, reliability and economic efficiency in the production of steel products can only be ensured by means of automated manufacturing facilities. The processes of steel industry are highly energy intensive and comprised of many complex unit operations. Iron ore and coal need preprocessing before feeding into a reactor, and liquid metals from different reactors need to be carefully handled. Further liquid steel is to be converted into solid form and then rolled into finished products. Each of these operations has a stake in the quality of steel produced, and also needs constant monitoring. There are many systems available for monitoring and controlling each unit operation. The process control systems in steel industry ranges from manual control to fully automated controls. The processes in the steel industry need to be equipped with two types of technologies namely (i) basic technologies, and (ii) advanced technologies. Basic technologies are those technologies which are fundamental to the production processes. They are generally the traditional technologies developed based on scientific principles. They are those technologies which are necessary for the production of the product at the needed productivity and efficiency level with low specific consumption of input materials. Basic technologies normally consist of chemical, mechanical, metallurgical, or production technologies. The advanced manufacturing technologies of today use the following five technological tools to have the greatest potential to influence the quality of the products besides influencing the improvement in the productivity and process efficiency. Automation – A new generation of automation systems are used in the production process which link the manufacturing process with remote control systems frequently through information technology. These new automation systems are equipped with remote contact or non-contact sensors and standardized interfaces, and, in some cases, eliminate totally the human interferences. This helps in eliminating the quality deficiencies in the products introduced through human errors. Automation also enables the manufacturing of the product with better precisions and close tolerances in a cost-effective manner. Integrated computational materials engineering – This tool creates computer models to simulate the properties of the products. By equipping the production processes with these models it not only helps in production of the products which meet the specification requirements but also reduces product rejection rates. This tool helps the process stabilization very quickly during the start of the manufacturing process. It also reduces the product testing load after its manufacture. This also helps the process to produce products in a better, faster, and cheaper way. Digital manufacturing – Digitalization of controls during the manufacturing process helps identifying and automatically correcting the flaws in the products during each step of the production process. This in turn improves the product acceptance rates. Industrial internet and flexible automation – With the help of such automation, process hardware can be linked together so that the equipment and machines are able to communicate with one another and automatically adjust product quality based on data generated by sensors. Additive manufacturing process – This is a very advance tool which creates three-dimensional objects based on digital models by successively depositing thin layers of materials. Use of this tool totally eliminates production of the products which are off in dimension tolerances. Automation though it is a part of the advanced technologies but often the terms advanced technologies and automation is used interchangeably. In this article also both the terms are used interchangeably. Advanced manufacturing technologies help in addressing a number of the steel industry needs. These new process technologies boost productivity and responsiveness to the customers by making it possible for the steel plants to quickly and easily modify and adjust the production processes according to customer requirements. As a result, the steel plants can generate a greater diversity of products from the production processes. These advanced technologies combine the efficiency of mass production with custom manufacturing with products made specifically to meet the needs of the customers. This is somewhat difficult, and often prohibitively expensive to do while using conventional technologies during the manufacturing processes. Application of advanced technologies to the basic technologies in the manufacturing processes is a recent trend. Advanced manufacturing technology applications have a big impact on the product quality. Rapid advances in information technology, sensors, and nano-materials are dramatically not only lowering the costs of leading edge manufacturing processes but also improving their performance in a big way with respect to the quality of the products. Slowly but surely, digitization has begun to permeate every aspects of the production processes, from engineering to management of the supply chain to the shop floor which is making production systems more intelligent and highly networked and more product quality oriented. This is helping the steel industry not only to improve the productivity but also to become more responsive to shifting customer needs. The word ‘Automation’ is derived from Greek words “Auto” (self) and “Matos” (moving). Automation therefore is the mechanism for systems that “move by itself”. However, apart from this original sense of the word, automated systems also achieve significantly superior performance than what is possible with manual systems, in terms of power, precision and speed of operation. Hence, automation is normally referred to the full or partial replacement of a function previously carried out by the human operator. Historically, automation has proven to be an efficient way to achieve cost-effective production in manufacturing, as well as in the process industry such as steel industry. In general, automation has also relieved humans from heavy, dangerous, complex, boring and time-consuming tasks. Automation has also been extensive not only in the actual production process of the steel industry but also in supportive tasks (e.g. material handling, transportation and storage etc.). Further, automation can provide solutions in highly time-critical situations in which there is insufficient time for a human operator to respond and take appropriate action or in other types of situations where the human being proves insufficient in one or more aspects. Automation is defined as a set of technologies that results in operation of machines and systems without significant human intervention and achieves performance superior to manual operation. Automation consists of electro-mechanical technologies (computers) applied to the process systems for the purpose of control of the production processes to relieve or replace a human operator. This definition is broad in the intent of automation, yet focused in its form – computers. Computers makeup the current generation of control systems and will be increasingly relied upon in the next to perform automatic data processing and provide operators with information crucial to effective decision making. Automation systems use field instruments and sensors for the data collection and its transmission to the processing unit which after analysis of the data sends signals to the control equipments for the purpose of controlling process parameters so that these parameters are kept within the acceptable limits. Objectives of automation include increase in the reliability and operational availability of production lines. In fact, automation is applied to man-machine (human-computer) systems for several purposes which include (i) improved performance, (ii) enhanced operational safety, and (iii) increased economy of work force. Systems performance can be improved by allocating to a computer functions which humans cannot perform due to inherent limitations in physical capabilities and mental capacities. For example, dynamic processes too complex for human operators to respond to manually, need to be accomplished through the use of automation. System performance can also be improved by allocating to a computer functions which human operators can accomplish, but are ill-suited for or that cause high workload and stress levels. Role of automation system in steel industry include smooth, accurate and stable functioning of the production processes, basically employed to produce finished steel products from raw/semi-finished materials using energy, manpower and equipment and infrastructure. Since the steel industry being essentially a “systematic economic activity”, the fundamental objective of the industry is to make profit which can be maximized by producing quality products in larger volumes with less production cost and time, and hence deployment of automation system in steel industry becomes essential. Advantages of automation include (i) control of the production process, (ii) improvement in the manufacturing process especially making the process more stable by ensuring ease of operation, (iii) improvement in the productivity, (iv) reduction in the production cycle from raw materials to the product, (iv) reduction in the specific consumption of materials as well as energy, (v) improvement in the quality of the product, (vi) reduction in the production cost, (vii) improvement in the health of equipment, (viii) environment management, and (ix) safety of operators and equipment. Operational safety of technologically advanced systems which are very common in modern steel industry can be enhanced through automation which purports to remove human errors from systems by replacing operators with virtually unerring machines. Automation results into increased human capacity and productivity, and reduction of operator workload and fatigue. Disadvantages of use of automation in steel industry include (i) low operator job satisfaction, (ii) operator failure to attend to critical system events (vigilance), (iii) operator over-reliance on the automated systems (complacency), (iv) low proficiency of operators in case of emergencies requiring manual takeover (skill decay), and (v) loss of operator system awareness. In fact, management of some steel plants see automation as reducing the status of the operator’s role to a button pusher, stripping him from using his knowledge and experience in controlling the processes. This pitfall of passive operator functioning under automation cause in operators (i) lack of vigilance , (ii) complacency, and (iii) losses in terms of (manual) skills and situation awareness. Despite technological advances to develop automated production processes which can perform functions more efficiently, reliably or accurately or at a lower cost than human operators in the steel industry, automation has still not replaced humans in the production processes. In lay terms, however, it is easy to think of automated systems as not including humans. However, most of these “unmanned” systems, such as automatic circuit board assembly operations, involve human operators in supervisory or monitoring roles. 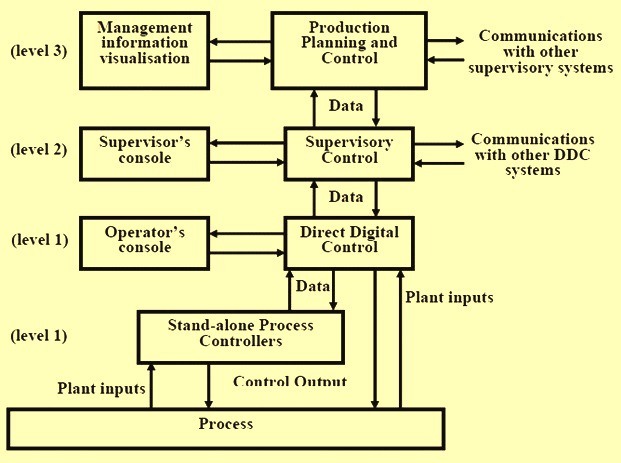 The supervisory control that the human as a supervisor can be seen as one or more of the five generic and interconnected functions. These functions are as follows. The first role for the supervisor is to plan what needs to be done over some period before any automation is turned on. The second role is to teach (e.g. instruct, command, program) the automated system with what it needs to know in order to perform its assigned function for that period. The third role is to turn on the automation and monitor the automatic action and detect any deviations or failures. The fourth role of the supervisor is to intervene in the automatic action if necessary and to decide on necessary adjustments to the automation. The fifth and final role is to evaluate performance and learn from observed experience. With the automation, the role which gets assigned to an operator is that of a system monitor. He is required to scan displays without taking any action to change the state of the system unless needed. The sole purpose of this monitoring is to determine whether a system is functioning normally or if human intervention is required. The decision to intervene in process control is influenced by (i) the accuracy with which an operator is to perceive the values of system variables, (ii) the likelihood of missing a critical event while concentrating on other information, (iii) the rewards and penalties associated with critical events, (iv) the strategy formulated by an operator, (v) the correlation between events, and (vi) the threshold below which an operator does not address a critical event. In case of failure of automation control, it becomes necessary for the operator to take over the controls of the process for which the operator has to have the skills and the system is to provide for this take-over of the control. There are always situations in steel industry when the operator as a component in the production system has to be involved to be able to handle machines and equipment during unforeseen situations. Consequently, both advanced automated systems and skilled human workers which work together are necessary to achieve flexible and efficient production. Robustness and flexibility of the production processes are therefore the key issues for the automation. However, since in the steel industry, the processes being very complex and also since the product customization has increased this complexity, it has become a requirement that steel industry adopts as an increased level and extent of automation. Automation is always associated with control which is a set of technologies that achieves desired patterns of variations of operational parameters and sequences for machines and systems by providing the input signals necessary. There are some of the differences in the senses that these two terms are generally interpreted in technical contexts. These are given below. Automation systems may include control systems but the reverse is not true. Control systems may be parts of automation systems. The main function of control systems is to ensure that outputs follow the set points. However, automation systems may have much more functionality, such as computing set points for control systems, monitoring system performance, plant startup or shutdown, job and equipment scheduling etc. Automation systems are essential for the steel plants where most of the processes have complex sequences of many operations. Hence today automation in the steel industry has become indispensable, since it plays a very special role. Whereas in the early stages it was used only for process control, today it provides additional information about the plant condition which helps in planning and preparing precisely the maintenance and repair of the plant and equipment. Today automation carries diagnostic functions which are used for condition-based maintenance. It helps in the increase the reliability of the equipment and their availability for the production. Steel industry automation needs several features which includes (i) the stringency of control precision requirements, (ii) the reliability to withstand 24-hour continuous operation in a plant where operations never stop, (iii) massive information processing due to the large scale of the operation, (iv) the stringency of the requirement for high response, and (v) the difficulty of stable operations and “building-in,” due to the complexity of the manufacturing processes. The ability of a human operator to control an automated system may be directly impacted by the level of task planning and performance interaction maintained with the computer controller. On the other hand, operator’s ability to respond to and make decisions based on system information is normally influenced by various levels of automation. Under these situations, the level of automation in steel industry can be (i) manual which is human control with no computer assistance, (ii) decision support where operator control with input in the form of computer recommendations, (iii) consensual where computer control the actions but operator consent is required to carry out actions, (iv) monitored in which case computer control is automatically implemented unless human vetoes, and (v) full automation where there is complete computer control with no operator interaction. Automation systems can be categorized based on the flexibility and level of integration in manufacturing process operations. Various automation systems which are used in the steel industry can be classified as follows. Fixed automation – It is normally custom-engineered, special-purpose equipment to automate a fixed sequence of operations. It is used in high volume production with dedicated equipment, which has a fixed set of operation and designed to be efficient for this set. Continuous flow and discrete mass production systems use this automation. Fixed automation is generally associated with high production rates and inflexible design of the steel product. Programmable automation – This automation system is used for a changeable sequence of operation and configuration of the machines using electronic controls. However, non-trivial programming effort may be needed to reprogram the machine or sequence of operations. Investment on programmable equipment is less, as production process is not changed frequently. The system consists of equipment designed to accommodate a specific class of product changes. This type of automation is typically used in batch processes where job variety is low and product volume is medium to high, and sometimes in mass production also. Flexible automation – This type of automation has the flexibility and is used to manufacture a variety of products. In this automation system operators give high-level commands in the form of codes entered into computer identifying product and its location in the sequence and the lower level changes are done automatically. Each production machine receives settings / instructions from computer. The machines automatically load / unload required tools and carries out their processing instructions. After processing, products are automatically transferred to next machine. It is typically used in job shops and batch processes where product varieties are high and job volumes are medium to low. However this type of automation is associated with lower production rates and products which needs frequent changing due to their dependence on the demand. Integrated automation system – It denotes complete automation of a shop of a steel plant, with all processes functioning under computer control and under coordination through digital information processing. It includes technologies such as computer-aided design and manufacturing, computer-aided process planning, computer numerical control machine tools, flexible machining systems, automated storage and retrieval systems, automated material handling systems such as robots and automated cranes and conveyors, computerized scheduling and production control. It may also integrate a business system through a common database. In other words, it symbolizes full integration of process and management operations using information and communication technologies. Steel plant automation makes extensive use of “Information Technology” (IT). Fig 1 below shows some of the major IT areas which are used in the context of steel plant automation. Steel plant automation also involves significant amount of hardware technologies, related to instrumentation and sensing, actuation and drives, electronics for signal conditioning, communication and display, embedded as well as stand-alone computing systems etc. Since the steel plant automation systems are growing more sophisticated day by day in terms of the knowledge and algorithms they use, they encompass larger areas of operation comprising several units or the whole of the steel plant, and they integrate production with other areas of steel plant functioning, such as, material management, customer relationship management, financial management, product quality management, cost control management, and sales management etc., the usage of IT has increased dramatically in the steel plant automation. When compared to labour intensive industries the steel industry can be seen very capital intensive, thus the role and applications of automation are often different. Instead of totally automated production lines automation is widely used to improve controllability of processes, quality of products and automated auxiliary tasks such as material handling. The distinguishing features of the steel plant automation system include the following. The steel automation system is generally reactive in the sense that it receives stimuli from its environment in which it is functioning and in turn produces responses that stimulate its environment. Naturally, a crucial component of the steel plant automation system is its interface to the environment. The steel plant automation system has to be real-time. By that it is meant that the computation not only has to be correct, but also must be produced in time. An accurate result, which is not timely, can be less preferable than a less accurate result produced in time. Therefore automation system is to be designed with explicit considerations of meeting computing time deadlines. The steel plant automation system is to be mission-critical, in the sense that the malfunctioning of any component of the automation system can bring about catastrophic consequences in terms of loss of equipment and even human loss. Hence extraordinary care is required to be exercised during its design to make it flawless. In spite of that, elaborate mechanisms are often deployed to ensure that any unforeseen circumstances can also be handled in a predictable manner. Fault-tolerance to emergencies due to hardware and software faults is frequently built in the automation system. There are five levels of automations which are commonly employed in steel industry. These levels are given below. Level 0 – Under this level, there is practically no automation and every control of the equipment and process consists of manual control. Level 1 – The level I automation is restricted to the production processes. It includes control of equipments and production processes. It includes dedicated digital controller (DDC). It does not include networking. The level 1 automation utilizes more and more modern field instruments, remote I/O’s, field busses and graphical interfaces. In different shops of steel pant the modern AC-drives provide new tools to advanced speed and torque control. Also the utilization of servo hydraulics has provided new improved possibilities to control steel production in wide range from continuous casting machines to small manipulators. Generally the level 1 control systems today are capable to handle more and more complex MIMO (multi input and multi output) systems and cascade systems with improved accuracy. Level 2 – This automation level includes supervisory control. Supervisory control combines the production scheduling and management information functions with the process control functions to form a hierarchical control system. It also includes process models, automatic material handling, tool setting, packing and other auxiliary systems. It utilizes physical process models to supplement the level 1 control giving calculated set-values to level 1 process control. The process monitoring and diagnostics play also important role in level 2 systems .In large systems a separate computer may be needed to handle each level, but in small systems, two or more operational levels might be collapsed into one computer level. The dedicated digital controllers at level 1 require no human intervention since their functional tasks are completely fixed by systems design and these are not inter-acted with, on-line, by operators. All other levels have human interfaces as indicated. The level 2 automation systems offer two main capabilities namely (i) tight optimized control of each operating unit of the plant based upon the production levels and constraints set by level 3 production planning and control (PPC) system by providing optimal operating set points to the manufacturing processes with this control reacting directly to any emergencies that occur in its own unit, and (ii) improved overall reliability and availability of the total control system through fault detection, fault tolerance, redundancy, and other applicable techniques built into the system’s specification and operation. Level 3 – Level 3 automation system contains scheduling and delivery status monitoring features. It includes production planning and control functions. Both production planning and production control functions are included in this level. It also includes maintenance planning and analysis of data. This system is a total integrated automation system. With this level of automation, the remote operation in-charge can view all the data. Enterprise resource planning (ERP) is a popular software based technology related to level 3 automation. Level 4 – It is just like level 3 controls but under this level control by satellite from a remote area is possible. The level 4 connects customer orders and material and makes capacity allocation to production. This complex ERP-system is used to manage the complete order-supply-chain follow-up and documentation. Fig 2 shows the functional hierarchy of a control system at the different level of automation. Distributed control system (DCS) is the technology platform which realizes the level 1 and level 2 automations. Level 1 and level 2 controls can be achieved normally through programmable logic controllers (PLCs), micro-processor based systems as well as programmable controllers (PCs) / work stations, as required. In DCS, each of the automation systems of the shop is subdivided in accordance with the functional requirements and covers the open loop and closed loop control functions of the different sections of the production shop. Distributed control system has been evolving rapidly since the mid-1980s from being essentially panel board replacement at their inception to become comprehensive plant information, computing, and control networks fully integrated into the mainstream of plant operations. This progress has been fueled in part by the technological revolution in microprocessor and software technology as well as the economic necessity. By the early to mid-1980s the personal computer industry matured marked with the IBM PC disk operating system (DOS) as the standard. This gave birth to the software industry which delivered feature-laden high quality inexpensive software packages. With this, it became possible to develop a relatively inexpensive scan control alarm and data acquisition (SCADA) package for a personal computer platform and integrate it with these general-purpose shrink wrap software packages, such as spreadsheet, desktop publishing, or database management and one could have a very cost-effective alternative to DCS. Because of performance and the general suitability limitations of these PC offerings, this approach had appeal mostly in cost-sensitive noncritical applications and where there existed a low safety or hazard risk. This concept, however, created an expectation and vision of the future, that is, open architectures. DCS was developed further and now it includes tools to address real-time process control applications by incorporating the low-cost shrink-wrap packages in their systems. Such packages include (i) relational database management, (ii) spreadsheet packages, (iii) statistical process control capabilities, (iv) expert systems, (v) computer-based process simulation, (vi) computer-aided design and drafting, (desktop publishing, (vii) object-oriented display management, (viii) windows-oriented display management, and (ix) information exchange with other plant systems. During the last 1980s and early 1990s the computer industry continued its transformation. Networking of systems into a cohesive whole promised to (again) revolutionize the steel industry, which has barely absorbed the impact of the PC revolution. Software and communications standard began to take hold, making interoperability among disparate computing platforms and application software a near-term reality. The steel organization, including the factory floor, could be moulded into a cohesive whole by making the various departmental systems work cooperatively at an acceptable integration cost. 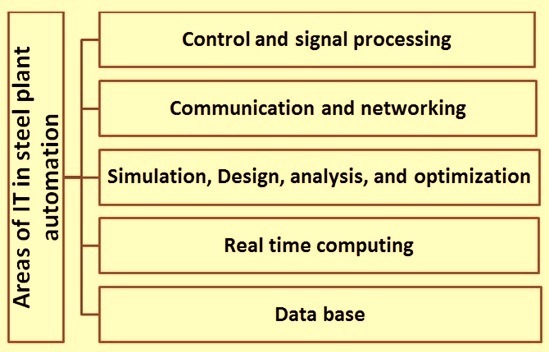 These added new technological features to DCS including (i) open operating system standards, such as UNIXC or POSIX etc., (ii) open system interconnect (OSI) communications model, (iii) client server cooperative computing model, (iv) X-window protocols for workstation communications, (v) distributed relational database management systems, (vi) SQL (Structured query language) access to distributed relational databases, (vii) object oriented programming and platform independent languages , and (viii) computer-aided software engineering. These characterize the modern DCS technology. DCSs today are distributed computing platforms with sufficient performance to support large-scale real-time process applications. Structurally DCSs traditionally are organized into five major subsystems, namely (i) operations workstations which act as the MMI (machine man interface) and provide visualization capability, (ii) controller subsystems which perform direct digital control, (iii) data collection subsystems, (iv) process computing subsystems for process optimization and supervision, and (v) communication networks. Open system communication standards are enabling DCSs to receive information from a set of similar compatible computing platforms, including business, laboratory information, maintenance, and other plant systems as well as to provide informations in support of applications, such as given below. Automated warehousing and packaging line systems so that a complete order can be coordinated from the receipt of raw materials to the shipment of the final product. Laboratory information management systems (LIMs), which perform in-process analysis as well as quality assurance inspections. Automated production scheduling for a plant accessing the business system and tying into manufacturing resource planning systems and finite-capacity scheduling packages. Application of DCS systems can be found in some areas of operations in large integrated steel plants.